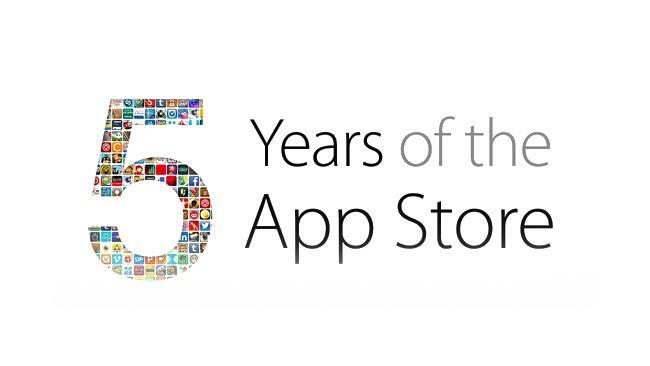 Apple's App Store this week turned five, and to celebrate the company is offering a handful of apps and games at no cost. Since launching in 2008, Apple's digital iOS store has grown from a mere 500 apps at launch to over 900,000, 350,000 of which are native to iPad, surpassing the 50 billion download mark back in May. That's an incredible number in such a short period—it really sets a precedent for all other mobile app stores. Apple says the five free games and five free apps are landmark and groundbreaking titles that really exemplify the quality on display in its App Store. These are titles that are a result of the evolution the App Store has gone through during its short five year existence. There's been not only a substantial growth in the sheer number of apps over the years, but a real bump in quality; some of the best experiences are exclusive to the iOS platform. Without specifically highlighting one app in particular this week, we thought it would be nice to sit back and congratulate Apple on its achievement. Of course, the store wouldn't be where it is today without the ingenuity of thousands of developers. But the company gave the world an ecosystem that other competitors are still trying to catch up to. Even today, iOS still gets exclusive dibs on the latest apps, and often those that are cross-platform look and perform the best on iOS. Just last year, App Store downloads topped 25 billion. That more than doubled this year; and growth is showing no signs of slowing down. July 10 is a big milestone day for Apple that will always be a big part of mobile history; each year up until now has had its own noteworthy milestone, like when Apple announced it paid out $1 billion to developers in 2010, or when the store itself was made available in 155 countries just last year. An app like Facebook debuted on iOS when the platform launched on July 10 back in 2008. Others, such as Yelp, Shazam, eBay and MLB.com at Bat also debuted back in 2008. Since then, we've seen wonderful experiences like Instagram, Angry Birds and many, many others hit the platform, and more will surely come as the store continues to grow. For now, you can celebrate the store's fifth anniversary by downloading Day One, How to Cook Everything, Traktor DJ and others for free.